The discography of Eric B. & Rakim, an American hip hop duo, consists of four studio albums, five compilation albums, 15 singles, and nine music videos. Eric B. & Rakim formed and signed a record deal with Zakia Records in 1985. The following year, the duo signed a deal with 4th & B'way Records. Their debut album Paid in Full was released in 1987. In the United States, it peaked at number 58 on the Billboard 200, number 8 on R&B/Hip-Hop Albums, and was certified platinum by the Recording Industry Association of America (RIAA). It appeared on the Dutch, New Zealand, and UK Albums Chart. Paid in Full produced five singles, four of which appeared on Hot R&B/Hip-Hop Songs. The fifth single "Paid in Full" (1988) peaked in the top five of the Dutch and New Zealand Singles Chart. Eric B. 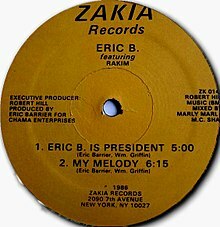 & Rakim began their critically acclaimed partnership in 1986 with the release of "Eric B. is President" / "My Melody". In 1988, Eric B. & Rakim released their second studio album Follow the Leader. It peaked at number 22 on the Billboard 200, number 7 on R&B/Hip-Hop Albums, and was certified gold by the RIAA. The album peaked at 25 on the UK Albums Chart, and appeared on the Swedish, Dutch, and New Zealand Albums Chart. Three songs from the album were released as singles: "Follow the Leader", "Microphone Fiend", and "The R", the first and last of which appeared on Hot R&B/Hip-Hop Songs. The duo's third studio album Let the Rhythm Hit 'Em was released in 1990. It peaked at number 32 on the Billboard 200, number 10 on R&B/Hip-Hop Albums, and was certified gold by the RIAA. The album appeared on the UK and Dutch Albums Chart. Let the Rhythm Hit 'Em spawned three singles, including the title track and "In the Ghetto", both of which peaked within the top 10 on US Hot Rap Tracks. Don't Sweat the Technique (1992) was the duo's fourth studio album. It peaked at number 22 on the Billboard 200 and number 9 on R&B/Hip-Hop Albums. It appeared on the UK Albums chart. Four songs, all of which appeared in the top 40 on R&B/Hip-Hop Songs, were released as singles from the album. The title track, released as the third single, topped Hot Rap Tracks. In 1992 after Don't Sweat the Technique, Eric B. & Rakim disbanded. From 2001 to 2010, five compilation albums have been released: 20th Century Masters – The Millennium Collection: The Best of Eric B. & Rakim (2001), Classic (2003), Gold (2005), Repaid in Full: The Paid in Full Remixed (2008), and Rarities Edition: Paid in Full (2010). None of these albums charted. "As the Rhyme Goes On"
^ a b c Huey, Steve. "Eric B. & Rakim: Biography". Allmusic. Rovi Corporation. Archived from the original on February 15, 2012. ^ a b c d e f g h i "Eric B. & Rakim: Charts & Awards: Billboard Albums". Allmusic. Rovi Corporation. Archived from the original on February 15, 2012. ^ a b c d e f "RIAA – Searchable Database: Eric B". Recording Industry Association of America. Archived from the original on December 19, 2015. Retrieved October 31, 2011. ^ a b c d e f "Discographie Eric B." Dutchcharts.nl (in Dutch). Hung Medien / hitparade.ch. Archived from the original on October 6, 2016. ^ a b c d e "Discography Eric B." Charts.org.nz. Hung Medien. Retrieved November 25, 2011. ^ a b c d e f g "Eric B & Rakim". Official Charts Company. Archived from the original on February 4, 2013. Retrieved November 25, 2011. For "Eric B. Is President", "I Ain't No Joke", "I Know You Got Soul", "Move the Crowd", and "Paid in Full": "Paid in Full – Eric B. & Rakim: Charts & Awards: Billboard Singles". Allmusic. Rovi Corporation. Retrieved November 25, 2011. For "Follow the Leader" and "The R": "Follow the Leader – Eric B. & Rakim: Charts & Awards: Billboard Singles". Allmusic. Rovi Corporation. Retrieved November 25, 2011. For "In the Ghetto", "Let the Rhythm Hit 'Em", and "Mahogany": "Let the Rhythm Hit 'Em – Eric B. & Rakim: Charts & Awards: Billboard Singles". Allmusic. Rovi Corporation. Retrieved November 25, 2011. For "What's on Your Mind", "Casualties of War", and "Don't Sweat the Technique": "Don't Sweat the Technique – Eric B. & Rakim: Charts & Awards: Billboard Singles". Allmusic. Rovi Corporation. Retrieved November 25, 2011. For "(Juice) Know the Ledge": "Juice (Original Soundtrack) – Original Soundtrack: Charts & Awards: Billboard Singles". Allmusic. Rovi Corporation. Retrieved November 25, 2011. ^ a b "Discography Eric B." Swedishcharts.com. Hung Medien. Retrieved November 25, 2011. ^ a b c "Eric B. & Rakim: Charts & Awards: Billboard Singles". Allmusic. Rovi Corporation. Retrieved December 24, 2011. ^ "20th Century Masters – The Millennium Collection: The Best of Eric B. & Rakim – Eric B. & Rakim: Overview". Allmusic. Rovi Corporation. Retrieved November 25, 2011. ^ "Classic – Eric B. & Rakim: Overview". Allmusic. Rovi Corporation. Retrieved November 25, 2011. ^ "Gold – Eric B. & Rakim: Overview". Allmusic. Rovi Corporation. Retrieved November 25, 2011. ^ "Repaid in Full: The Paid in Full Remixed – Eric B. & Rakim: Overview". Allmusic. Rovi Corporation. Retrieved November 25, 2011. ^ "Rarities Edition: Paid in Full – Eric B. & Rakim: Overview". Allmusic. Rovi Corporation. Retrieved November 25, 2011. ^ "Microphone Fiend – Eric B. & Rakim: Overview". Allmusic. Rovi Corporation. Retrieved November 25, 2011. ^ "Mahogany (Vinyl Single) – Eric B. & Rakim: Overview". Allmusic. Rovi Corporation. Retrieved November 25, 2011. ^ a b "Larger than Life – Jody Watley: Charts & Awards: Billboard Albums". Allmusic. Rovi Corporation. Retrieved November 25, 2011. ^ "Discographie Jody Watley". Dutchcharts.nl (in Dutch). Hung Medien / hitparade.ch. Retrieved November 25, 2011. ^ "Discography Jody Watley". Charts.org.nz. Hung Medien. Retrieved November 25, 2011. ^ a b c d e f g h "Eric B. & Rakim". Vevo. Retrieved November 25, 2011.